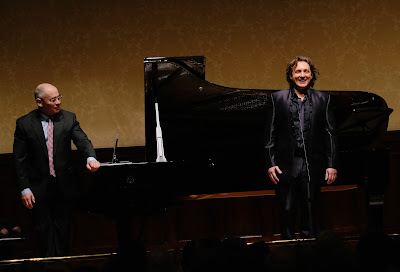 Ivan Magrì is a classic Italian lyric tenor (he sings Nemorino in Donizetti's L'Eelisir d'amore at Covent Garden in May) At his Rosenblatt Recital last night (3/4/2017) at the Wigmore Hall he gave us a programme which was classic in its own way in its combination of operatic arias and Italian song. Accompanied by Iain Burnside, Magrì sang two of Bellini's songs, arias from Donizetti's L'elisir d'amore, from Donizetti & Salvi's Il duca d'Alba, and from Verdi's I Lombardi and Rigoletto, songs by Paolo Tosti, arias from Massenet's Werther and Ernesto de Curtis's Non ti scordar di me and Stanislao Gastaldon's Musica proibita, finishing with 'Che gelida manina' from Puccini's La boheme. He even gave us O sole mio as an encore. The relatively unfamiliar arias from Il duca d'Alba (Matteo Salvi's complete of Donizetti's unfinished Le duc d'Albe) and I Lombardi added interest, but the main focus was on Magrì's voice and he did not disappoint. He certainly had both the voice and the technique to bring off the programme. Bellini's Malinconia, Ninfa gentile was given the full operatic treatment, so we were able to appreciate Magrì's vibrant, lyric Italian tenor (albeit at the expense of Bellini's delicate song), with a fine openness to the voice, and interestingly dark sheen to it yet a nice evenness of emission all the way to the top. In the second Bellini song, Ma rendi pur contento, Magrì brought things down to a more intimate level suitable to the material, here we could appreciate his lovely mezza-voce. He also started to relax on stage, and give us a very dynamic, mobile performance. Throughout the evening, the best moments were when Magrì forgot himself and really sold the material to us, creating a strong personal link in the concert hall. The role of Nemorino from Donizetti's L'elisir d'amore is in Magrì's repertoire and his account of 'Un furtiva lagrima' was convincing drama, and full of charm. We also got to hear his lovely hushed mezza-voce, he caressed the opening phrase beautifully and though he opened the voice up for moments like 'M'ama!' he kept returning to this lovely intimate delivery, creating some magical moments. 'Angelo casto e bel' from Il duca d'Alba is less well known, the aria is one which Matteo Salvi wrote for his completion of Donizetti's unfinished Il duc d'Albe. The opening recitative was certainly not Donizetti, though the aria itself sounded more like the real thing. Magrì made the recitative dramatically convincing, and in the aria again combined a lovely mezza-voce with thrilling moments, whilst keeping a nice sense of musical phrasing. 'La mia letizia infondere' from Verdi's I Lombardi all prima crociata (written eight years before Rigoletto) almost sounds like a dry run for 'La donna e mobile', but Magrì convinced us in the way he sang with vibrant voice yet a nicely buoyant feel for the phrasing. 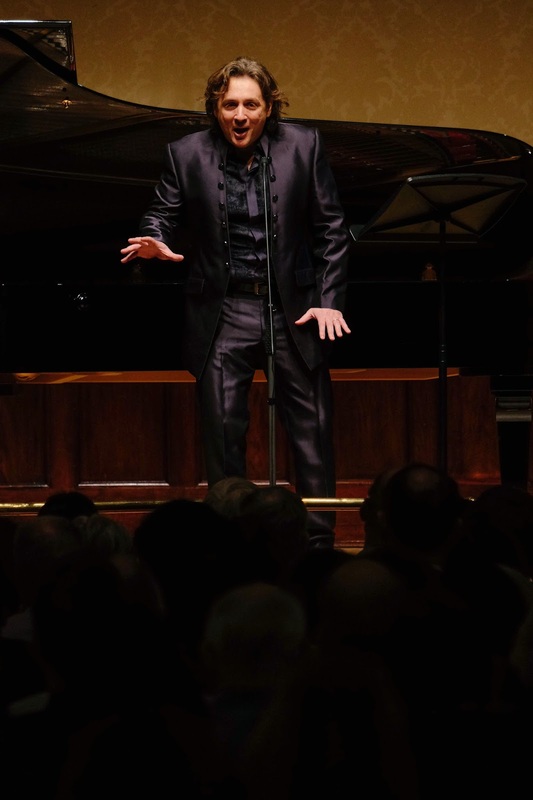 His style, at times, felt a bit stock with the classic gestures such as the extended top notes, and a repertoire of arm movements, but at least his voice was one which were certainly able to warm to. Next came a pair of more familiar arias, 'Parmi veder le lagrime' and 'La donna e mobile' from Rigoletto, both sung with charm and character. Magrì certainly didn't just belt numbers out, he moved freely between mezza-voce and full voice, singing with great charm and character. 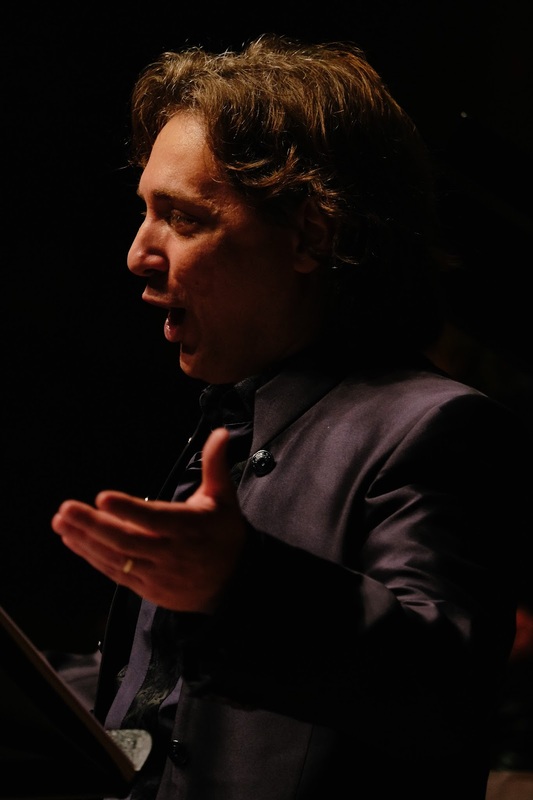 It was also a treat to hear an Italian in this repertoire, and hear how he really relished the words. We certainly didn't need our printed texts to follow his Italian, and I loved the way he savoured individual words and made sequences strophic verses all subtly yet vastly different. After the interval we returned to Italian song with a pair by Edwardian England's favourite Italian, Paolo Tosti. Both the songs performed by Magrì, A vucchella and L'alba separa dalla luce l'ombra were in fact premiered in London, where Tosti taught the Royal family, naturalised as an Englishman and received a knighthood. (I am still waiting for some enterprising Anglophone tenor to revive Tosti's English-language songs such as Goodbye). A vucchella is written as a classic Neapolitan song, and Magrì gave us the full charm, taking the song seriously and really selling it to us. L'alba separa dalla luce l'ombra was more operatic. Tosti's songs do not sing themselves, and Magrì certainly has the technique to bring the song off. We then returned to opera with a pair of arias from Massenet's Werther. Magrì made a creditable effort with the French, though this still needs some work as there were some odd vowels. Of course, he sings the arias with an Italian technique, but this is something we have come to accept. 'O nature pleine de grace' had a nice fluidity of phrasing and rose to real passion. 'Pourquoi me reveiller' was impassioned, but still with a good sense of line and moments of intimacy too. Magrì and Burnside followed this with a pair of classic Italian songs, De Curtis's Non ti scordar di me (from a 1935 film) and Gastaldon's Musica proibita from 1881. This is repertoire designed to show off the voice and in both, Magrì sang a nice combination of conviction and charm, often singing quite lightly and adding a lovely swagger. He finished with 'Che gelida manina' from Puccini's La Boheme, always a bit of a problem piece because the ending naturally leads into Mimi's solo and the final duet. But Magrì sang with such beauty of tone and dramatic conviction that we were certainly convinced. Throughout the programme Magrì was accompanied with aplomb by Iain Burnside, making even the more conventional 'oom-pah' accompaniments seem expressive. The audience was highly appreciative and we were treated to a single encore O sole mio. Ivan Magrì makes his Royal Opera House debut on 27 May 2017 in Donizetti's L'elisir d'amore, see Royal Opera House website for details.